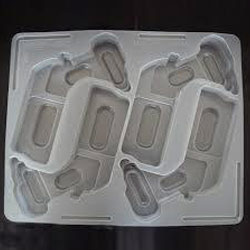 Prominent & Leading Manufacturer from Umbergaon, we offer plastic tray. We are a famous name in this industry engaged in offering Plastic Tray. Our offered trays are widely appreciated for their precise designs and are used for arranging multiple things in a proper manner. Our range of trays is made available to the clients in different sizes, dimensions and other specifications to meet the clients’ diverse demands for multiple packaging solutions. Looking for Bakery Packaging Tray ?